Below is Sample Well information. 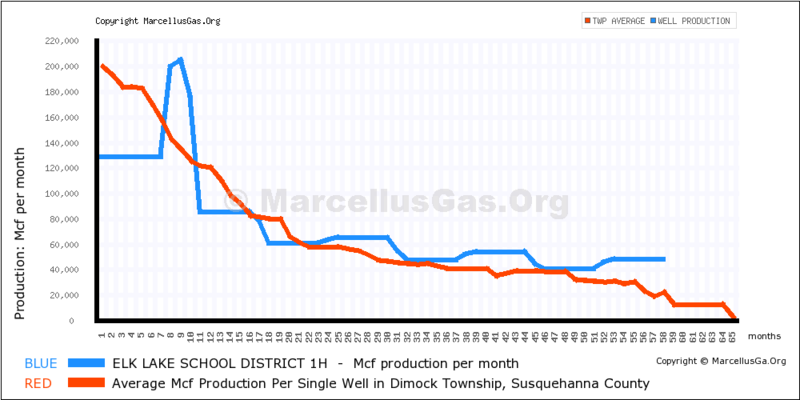 Unlimited access to detailed Well Data Reports is available for Full Members. Become a Full Member. As a Guest Member, you may view up to 5 detailed Well Data Reports - Become a Guest Member. The ELK LAKE SCHOOL DISTRICT Well-Pad currently has 2 permitted wells assigned to the site. You chose to view the well report for the ELK LAKE SCHOOL DISTRICT 1H well, shown first in the link list below. Click on the links immediately below to view individual Well Data Reports, or scroll down the page to view the individual reports for each well. Additional Comments: Produced Brine from this well was delivered to the Carlson, Carson, Rozell, Oakley and Lauffer wells for recycling and reuse. Additional Comments: Water fraction of waste streams recycled at Hibbard Tank Pad for reuse by Cabot. Number of homes heated is based on an annual consumption of aproximately 112,000,000 BTU's per home. This value can vary significantly depending on climate zone, insulation levels, and occupant behavior. Adjusted production totals compensate for the DEP production values reported for the first half of 2010, which are combined with partial data from 2009. The values displayed represent a pro-rated value based on the percentage of time represented in the first half DEP report for the 2010 period. 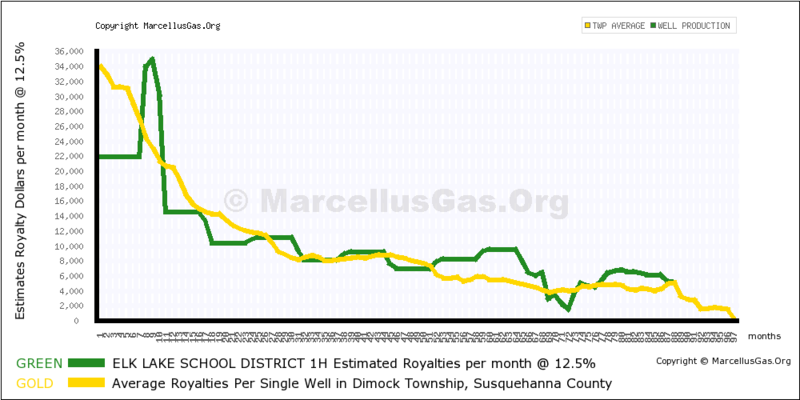 DEP production values indicate that 2004 was the first year production reports were submitted by the drilling companies for Marcellus gas wells. 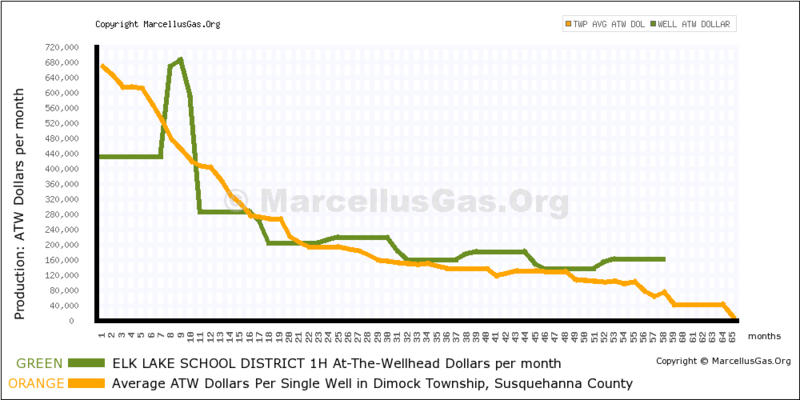 Estimated royalty earnings represent 12.5 percent of the at-the-wellhead value for the volume of gas reported to the DEP by the operator of the well, and does not consider any production cost deductions that might apply. Comment text: Produced Brine from this well was delivered to the Carlson, Carson, Rozell, Oakley and Lauffer wells for recycling and reuse. Waste Report information has been compiled using Pennsylvania Department of Environmental Protection (PADEP) reports, and includes data from the time period beginning July 2009 and ending June 2011. The name of the waste treament facility is included when available, along with any available PADEP comments regarding the waste. Comment: At time of inspection, drilling depth was at 1522. Company Man ron Savage indicated they will be setting 9-5/8 casing at 1510. Haliburton was on site and will be cementing casing later in the day. No violations were observed at time of this inspection. Comment: I inspected the well head for evidence of leakage. There was no visible bubbling observed. The well is shut in and has not been fracced yet. Comment: Well is online. Site has been restored. chain-link fence around well and gated. No violations observed. Items and values displayed in the inspections & violations reporting are based on PA DEP Oil/Gas Compliance data as of Aug 16th, 2014. Gas Company: CABOT OIL AND GAS CORP.
Fracturing Report: Fracturing Information is not available for this well. Comment: : I met with Ron Savage, the Company Man at the site. Mr. Savage indicated that drilling depth was currently at 7256¿. Mr. Savage further indicated that they were currently stuck at depth and were washing out the hole with mud. Once the hole is cleaned out and drill pipe removed, 5-1/2¿ production casing is to be set at approximately 7300¿. All E/S controls appeared to be in place and functioning properly. The pit liner in the reserve pit appeared to be in good condition. No violations or outstanding issues were observed at the time of this inspection. Comment: I inspected the well head for evidence of leakage. There was no visible bubbling observed. Comment: Routine inspection. Well is online. Site has been restored. Chain-link fence around wells and gated. No violations observed.